I have always been too intimidated to make any sort of candy. It involves boiling sugar with other ingredients, taking temperatures, taking care not to burn it…and seemed to be too much work. 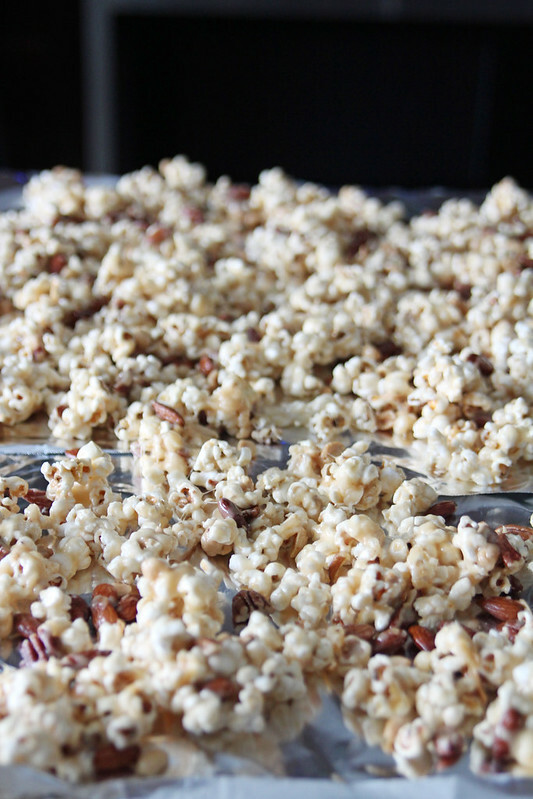 BUT, at our annual playschool bake sale there was a lot of homemade poppycock and caramel corn…and I decided I needed to try making some of my own. I searched the internet for a few recipes to try, but didn’t come across anything and there was a lot of conflicting information. So, I ended up doing like I always do and texted my mother-in-law to see if she had a recipe. She texted me back and told me she had a great recipe, so I got all the stuff I needed and got read to make it. 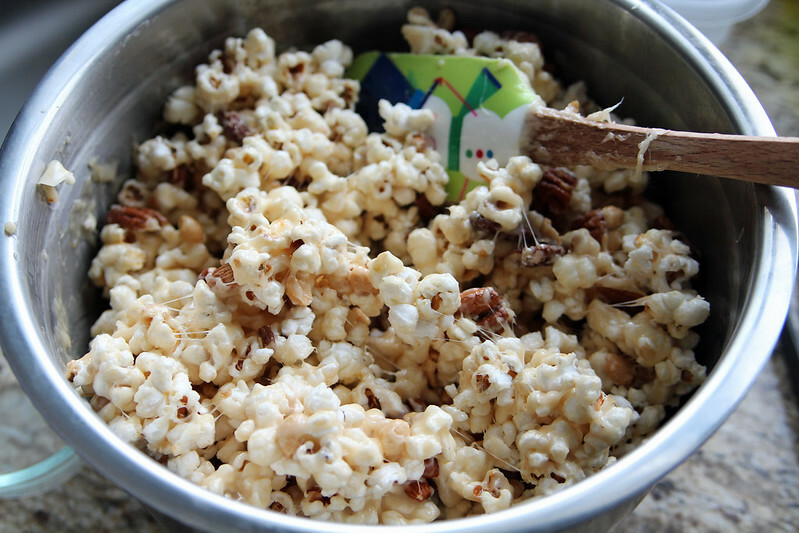 Before we get talking about making the caramel, instead of wasting money popping bags of microwave popcorn (which is totally fine if you want to use popcorn from this method), I just heat up some canola oil in my wok, and use about 2/3 cup of popcorn seeds, put the lid on, gently stir the pan and that’s about 16 cups of popcorn for me. In a large saucepan melt together sugar, corn syrup, butter and cream of tartar and bring to a boil with candy thermometer. Cook to hard ball stage which is 250-266ºF, or when a spoonful of the sugar mixture is placed in a bowl of cold water, a ball should form. Take that ball out of the water and if it holds it’s shape, it’s at hard ball stage (you can watch this video). Take off heat and stir in vanilla and baking soda. 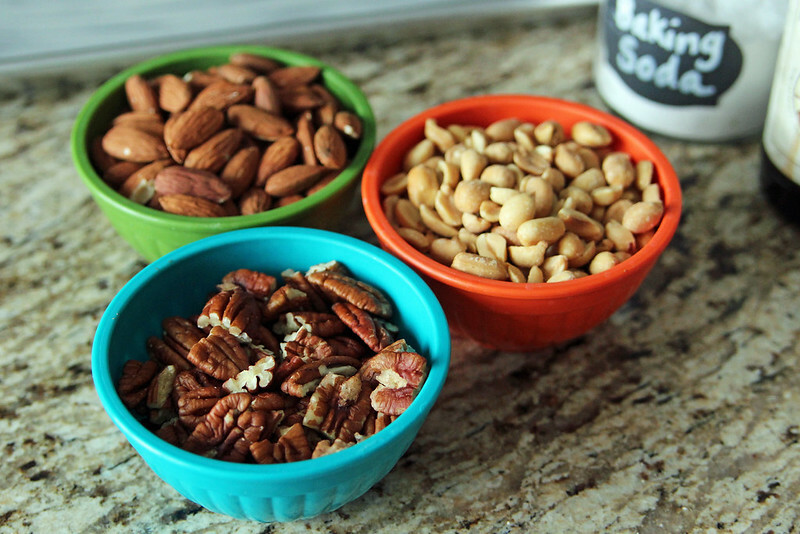 In a very large stainless steel bowl place 16 cups of popcorn and your 4 cups of nuts together. 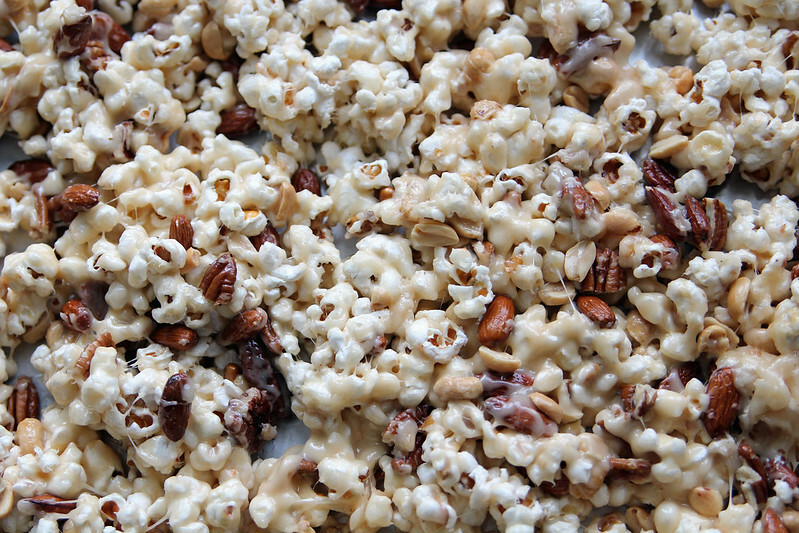 Drizzle candy over popcorn and nuts and stir really well to coat. Place poppycock on 2 well-buttered baking sheets and bake at 300ºF for 15 minutes. Spread on tinfoil and break apart when cool. 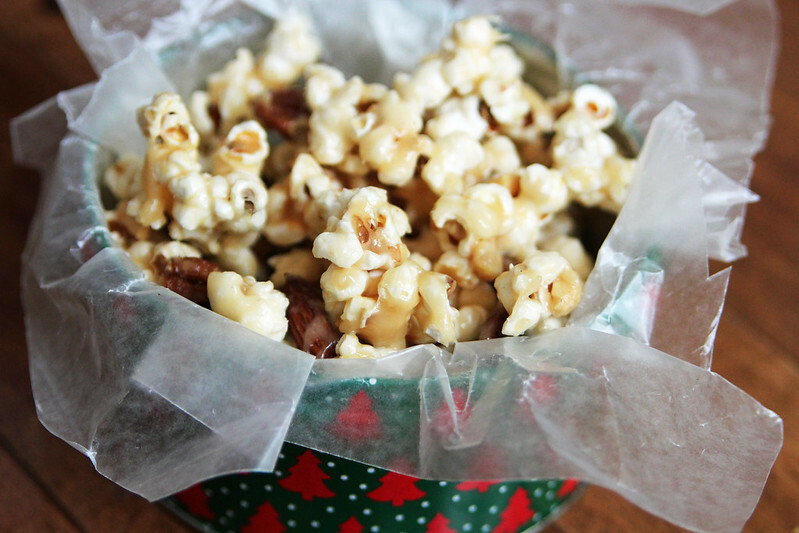 Crunchy caramel popcorn mixed with pecans, almonds and peanuts. Makes a wonderful gift for family and friends at Christmas. In a large saucepan melt together sugar, corn syrup, butter and cream of tartar and bring to a boil with candy thermometer. 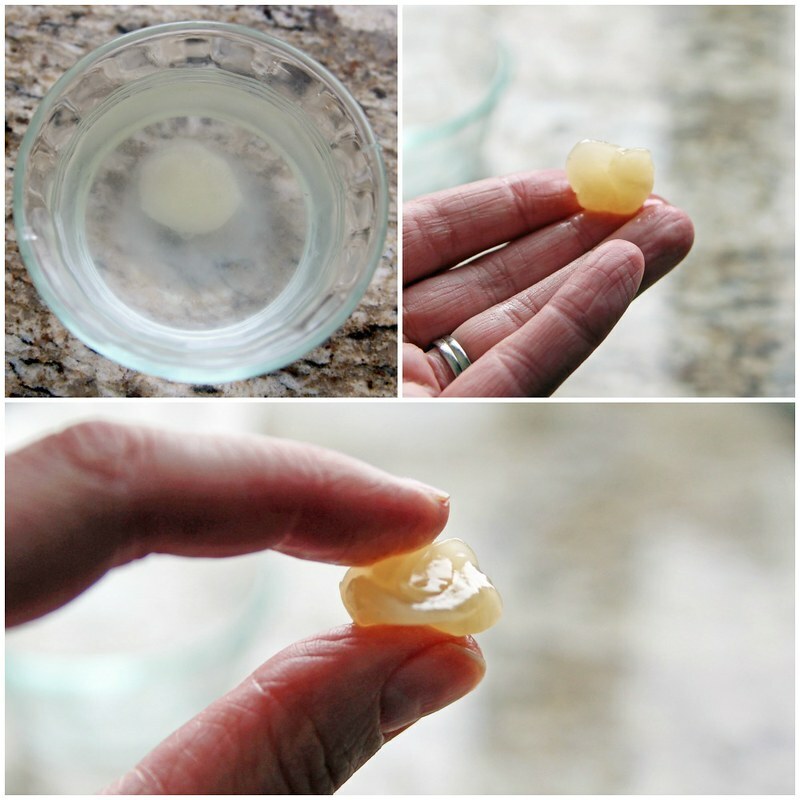 Cook to hard ball stage (250-266ºF), or when a spoonful of the sugar mixture is placed in a bowl of cold water, a ball should form. I didn’t make this first batch with a candy thermometer, but I’m ordering one right now to make sure that I get to that exact right temperature next time. My batch had some pretty gooey parts that got a bit sticky on the teeth when eating, but it still tastes absolutely great! I hope you make this and enjoy! « Never Lose Your Lids Again! Hi. 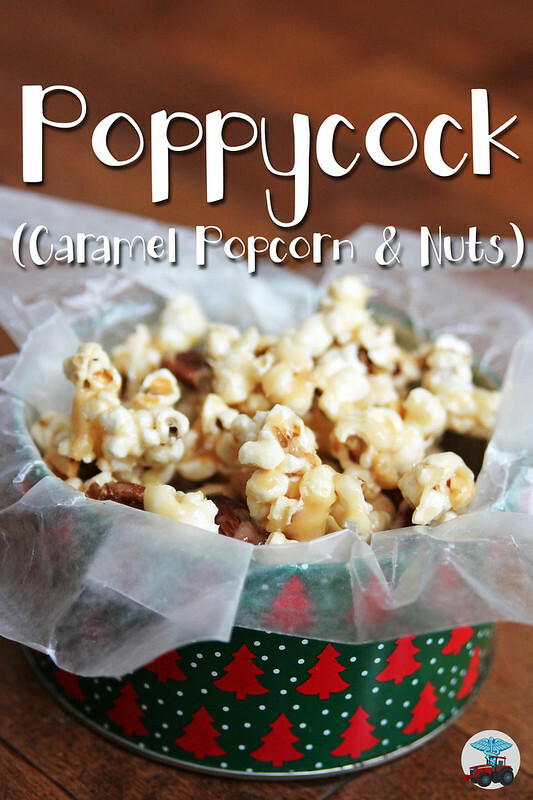 Was always hesitant in trying to make this. I’m so glad I found your recipe. I just finished and it is wonderful. I appreciate your site and will try other recipes in the future. Again thanks…hope I can keep some to give as gifts and not have my family eat it all. 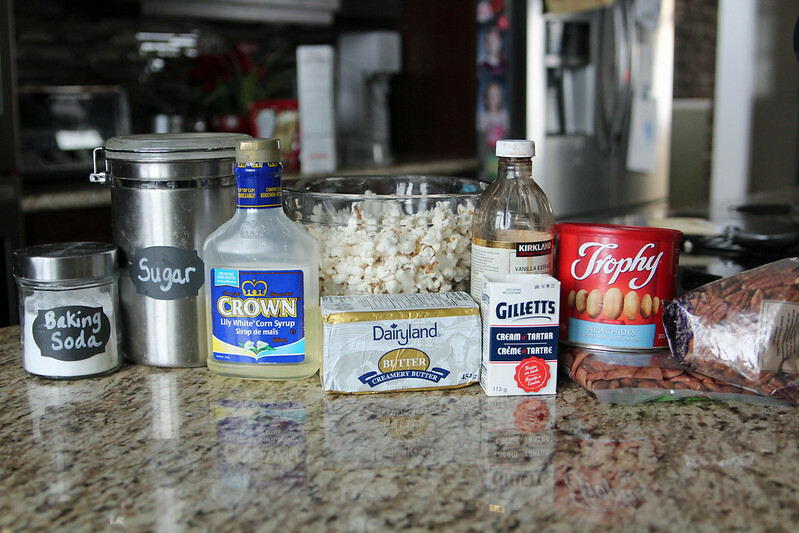 Thanks for the recipe sarah, I never try all these ingredients before to make popcorn.